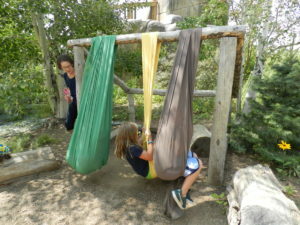 As promised, today I will tell you why the Children’s Garden at the Denver Botanic Gardens is so special. The Children’s Garden at the DBG, a rooftop garden across the street from the main garden, was quite a surprise. Most chidren’s gardens are designed primarily to entertain rather than educate. I believe that the goals at the DBG are reversed. The primary focus of this garden is providing opportunities to experience the plant life as it changes from season to season in the six different ecosystems of Colorado. Children love to play in water, especially on a hot day. 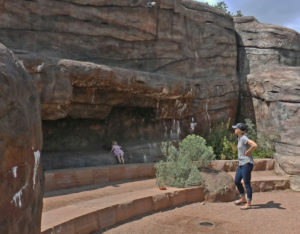 This cave providies an opportunity for adventure, even for the very young. The seat of these swings is so close to the ground that a possible fall will have no unforeseen consequences. Everything in the Children’s Garden, including tables and chairs, is sized for little ones. or have a picnic at child-sized tables and chairs. 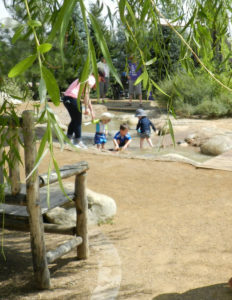 Children are encouraged to experience the garden by touching and smelling. 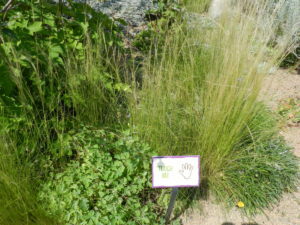 Children are encouraged to touch plants to experience their different textures. If you are visiting Denver, be sure to visit the Denver Botanic Garden and plan on spending the day. In fact, perhaps you should just plan a visit to Denver. Simply brilliant...I do not think they had this five years ago...I am going back to experience this first hand! Excellent! I know you'll enjoy it.